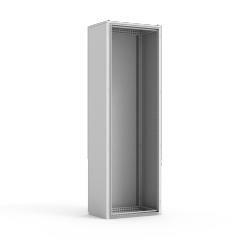 The mild steel compact floor standing enclosure range, MKSL is available off the shelf in many different sizes, and is ideal for power distribution applications. The front opening can be segregated with partial panels or doors to meet power distribution system requirements. Only parts required will be delivered, which means full flexibility, lower costs, and greater procurement efficiency will be achieved. Body: 1.35 mm painted steel. Rear and roof panels: 1.5 mm painted steel. Four times folded and seam-welded frame. Integrated double row hole pattern. Fitted by M6 torxscrews. Standard facilities for rear door mounting. All panels are earthed through their fittings and are equipped with a separate earthingstud. Body with rear panel and roof panel. Delivery also includes earthing bolts. Delivered on a pallet with identical width of the enclosure. All packing material is recyclable. Mild steel compact floor standing enclosure, available in a wide range of sizes, without a front door and bottom plates for power distribution applications. Customers can choose enclosures that meet their size requirements, off the shelf. The enclosure's front opening can be segregated by mounting partial panels or doors to meet the requirements of the power and distribution system, for example, for a motor control centre (MCC).